Euphorbia lathyris is an ornamental biennial plant with upright unbranched stems which carry four rows of rigidly arranged deep green leaves. It is fast growing and can grow up to 120cm (48in) tall. As a biennial, it will send up stems of leaves in its first year and flower in its second year. The flowers themselves tend to be inconspicuous and are yellow-green in colour. The seeds grow in green clusters of three seeds. When they ripen, they dry out and turn brown, looking a little like Capers, they give them their common name of the Caper Spurge. It will readily self seed, so the flowers are often removed as they fade to prevent the garden becoming a forest of its seedlings. Euphorbia lathyris is an interesting plant, commonly known as the Mole Plant it is reputed to deter moles and any other subterranean pests. They are said not to like the scent exuded by the roots into the soil, or the taste it gives to worms. This is said to be most effective in its second year of growth. Although lots of reports cast doubt on this ability, members of this genus are rarely if ever troubled by browsing deer or rabbits! Soak the seeds for two hours in warm water before sowing. Euphorbia plants do not like root disturbance, so it is best to sow the seeds in place of growth or to use deep plugs or pots. Grow at 20 to 26°C (68 to 78°F) . Be patient, germination is generally very slow, it may occur in two to three weeks at but sometimes can take a few months. Sow directly where they are to grow, once temperatures have risen and the soil has warmed. Sow on the surface of the soil and keep damp but not wet. Surface sow the seeds into plugs or small pots using a good seed sowing mix or well drained soil and cover seed with vermiculite, do not exclude light. Prick out each seedling as it becomes large enough to handle, transplant into larger pots to grow on. Gradually acclimatise to outdoor conditions for 10 to 15 days before planting out. Plant 30cm (12in) apart in sun and ordinary well drained soil. Euphorbia need full sun to partial shade, with a well-drained soil mix. The plants should be well watered and be allowed to dry before watering again. The plants are native to poor soils and do not need fertiliser or excessive water. Too much of either will provide lush growth but at the expense of flowers. Borders and Beds. Mole and pest deterrent. 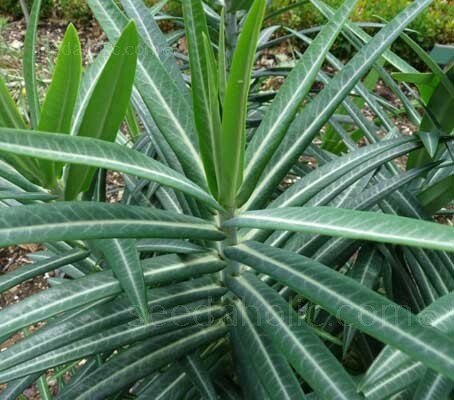 Euphorbia lathyris has an interesting history. All parts of the plant are emetic and purgative and is nowadays considered to be too toxic for it to be used medicinally. The latex in the stems has been used externally as a depilatory but it is too much of an irritant to be used safely. Beggars sometimes used the leaves to create unsightly skin sores, which would cause passers by to give them more money out of pity. The French are said to have eaten the seeds as a purgative even though they are as toxic as the plant. This plant is considered to be toxic and although not precisely poisonous – you certainly wouldn't want to eat it and would be violently sick if you did. While toxic to humans and most livestock, goats seem to enjoy eating it and are immune to the toxin. However, the toxin can be passed through the goat's milk. All Euphorbia plants contain a milky white latex sap which will irritate the skin, but Euphorbia lathyris seems to cause the most concern. This may be because it is a tall plant and is particularly sappy, it is a biennial plant which dies after producing seeds in its second year, which of course we gardeners will remove as we tidy up our gardens. Contact with the latex sap will cause photosensitisation, which in some individuals can be extremely painful, so the important thing is to protect all exposed skin and eyes when handling it, especially avoid working with it in full sun. It will cause serious injury if splashed in the eyes, if this happens you will look like you have been in a bar fight for days, so, although this may seem a little over the top, please consider wearing some form of eye protection. Just a pair of glasses, even sunglasses will help. Once you have finished gardening, wash your hands and put the clothes you were wearing into the washing machine, just in case any sap remains on the fabric. Euphorbia has a long history as a medicinal plant, it was known to Theophrastus (371 - 287BC). The genus was named after Euphorbes (50BC - AD23), the personal physician to the Numidian King Juba II, who is said to have discovered the toxic and curative potential of the white and milky sap in the plant. The word Euphorbus derives from the Greek eu meaning ‘good’ and phorbe meaning ‘pasture or fodder’ thus giving the meaning ‘well fed.’ Some sources suggest that Juba was amused by the play upon words and chose his physician's name for the plant because of its succulent nature and because of Euphorbus' corpulent physique. Commonly known as the Mole Plant, it is reputed to deter moles which are said not to like the scent exuded by the roots into the soil, or the taste it gives to worms. In the US it is known as the Gopher Spurge or Gopher Plant for much the same reason. 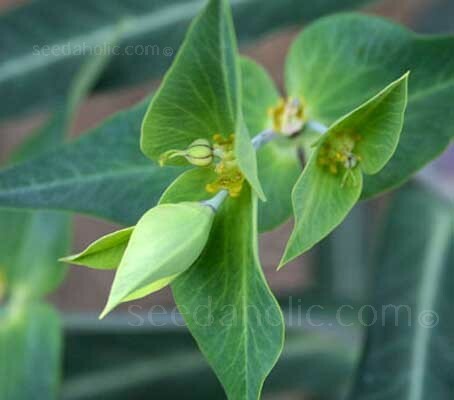 The other common name of Caper Spurge takes its name from the seed pods which look like capers but are very poisonous. Euphorbias have also been given the common name ‘spurge’ from the Latin expurgare ( French espurgier ) meaning 'to purge', as the sap of herbaceous euphorbias used to be used as a purgative, a laxative. The Natural History (Latin: Naturalis Historia), an encyclopedia published circa AD77-79 by Pliny the Elder says: "The tithymalos (spurge) is called by our people the ‘milk plant,’ ('Herba lactaria') and by some persons the ‘goat lettuce’. It belongs to the enormous genus of Euphorbia which includes such plants as the traditional holiday poinsettia (Euphorbia pulcherrima), common garden spurge (Euphorbia cyparissias), and quite a few species of cactus look-alike plants, such as Euphorbia neriifolia. Euphorbus was the Greek physician of Juba II, the King of Mauretania. Juba was educated in Rome and married the daughter of Antony and Cleopatra. Euphorbus was interested in botany and had written about an African cactus-like plant he had found or which he knew about from the slopes of Mt. Atlas which was used as a powerful laxative. 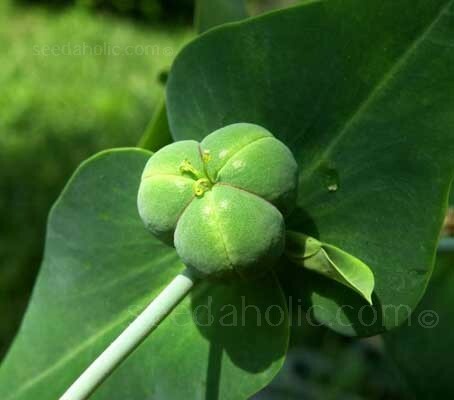 That plant may have been Euphorbia resinifera which, like all Euphorbias had a latexy exudate. Euphorbus had a brother named Antonius Musa who was the physician to Augustus Caesar in Rome. When Juba heard that Caesar had honoured his physician with a statue, he decided to honour his own physician by naming the plant he had written about after him. One species of Euphorbia, E. regis-jubae, was named in honour of King Juba II. Botanist and taxonomist Carl Linnaeus assigned the name Euphorbia to the entire genus in the physician's honour. Sow in early spring to early autumn.